We opened our doors for the first time at Elevate CA on 20 April 2009 – almost a year ago. Our first year has surpassed our wildest expectations, and we’d like to celebrate our first birthday by saying “thank you” to the people who have been part of our journey. So here’s your invite! Where: Elevate CA office, Level Four, 35 Robert Street, Whangarei. 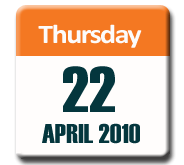 When: Thursday 22 April 2010 – 5:30pm to 8:00pm. Why: To say a big “thank you” to everyone who has been part of the Elevate CA journey. RSVP: To party@elevateCA.co.nz by 17 April. Remember to give us the names of those who will be attending with you! Bring: Just yourselves and a sense of humour. The hospitality is on us. Parking: Right outside the door at that time of day. Looking forward to hearing from you – and seeing you on 22 April! I’d love to come and celebrate with you guys this Thursday thank’s. See you then.